"Brian Leaf has done it again! 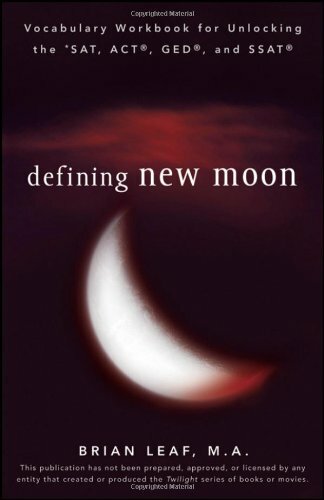 Just as Defining Twilight did, Defining New Moon continues to help students improve their vocabulary while reading Stephenie Meyer's New Moon." Why is Bella desolate and haggard? Will Jacob win her over with his infectious affability? Can Edward dare to flout the rules and summon the belligerent ire of the Volturi? State your allegiance: Team Edward or Team Jacob? Join Bella, Jacob, and Edward as you learn more than 600 vocabulary words for the *SAT, ACT, GED, and SSAT! With hundreds of new vocabulary words, this book can be used completely on its own or as a follow-up to Defining Twilight. Use this workbook side-by-side with your own copy of Stephenie Meyer's New Moon!